The alfalfa in Alfa-A Original is dried at a very high temperature to reduce the risk of mould. Efficient extraction processes ensure Alfa-A Original has a low dust content to promote a healthy respiratory system. 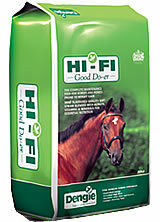 Hi-Fi GOOD DO-ER is the complete maintenance feed for horses and ponies prone to weight gain. Providing approximately 7MJ/kg of slow release energy, it is similar to late cut hay and is ideal for helping to control the calorie intake of horses and ponies who need to watch their waistlines. Hi-Fi GOOD DO-ER is a blend of alfalfa and quality soft straw lightly coated with molasses and contains spearmint oil. Vitamins and minerals have been added to provide a balanced diet when fed at the recommended levels. Hi-Fi Good Do-er can be used as a partial or complete hay replacer and as it is lower in calories than average hay and haylage, it can be an effective way to promote weight loss. 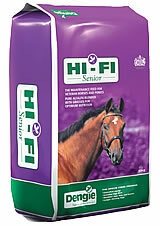 Hi-Fi Good Do-er can be fed on its own as the bucket feed for horses and ponies undertaking a weight loss programme or to replace part of the hay ration. If using as a hay replacer, Hi-Fi Good Do-er can be fed in large tub trugs or similar. Why not purchase a Dengie Measuring Bucket from our on-line shop to help ensure you are feeding the right amounts? 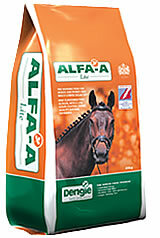 At Dengie we believe that a diet based mainly on fibre is the best way to feed horses and ponies and with our full range of products, from the Alfa-A and Hi-Fi ranges through to our Natural Vitality Supplements, Dengie can help you formulate the right diet for your horse or pony whatever their age or work load. Hi-Fi Lite is a short 'chop' that takes as long to chew as the equivalent weight of hay or haylage, helping to keep horses occupied and satisfied. 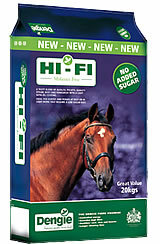 For horses on restricted grazing, Hi-Fi Lite is ideal as it delivers sufficient fibre to maintain gut function. The alfalfa in Hi-Fi Lite is dried at a very high temperature which reduces mould. Extraction processes help to reduce the dust content to promote respiratory health. Alfa-A Molasses Free is a straight feed and although alfalfa is abundant in natural nutrients a source of broad-spectrum vitamins and minerals should be added alongside to ensure a balanced diet such as Natural Vitality Performance Vits & Mins or Alfa-A Balancer. 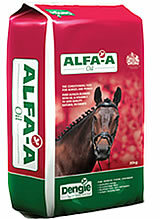 Alfa-A Molasses Free may be fed dry or dampened with water or a soaked product such as Dengie Alfa-Beet. 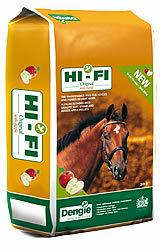 Hi-Fi Original with Apple contains real apple pellets to provide a really tasty fibre feed for your horse or pony. The apple pellets in Hi-Fi Original with Apple contain apple skins which is where the natural antioxidants are mostly found. They complement the antioxidants found naturally in alfalfa to give a wide range of health benefits. This is equivalent to us eating our 5 portions of fruit and vegetables of different colours a day to ensure we receive a wide range of antioxidants. Hi-Fi Original with Apple can be fed as the sole energy source: just add a broad-spectrum vitamin and mineral supplement, such as Dengie Natural Vitality Vits & Mins or alternatively a feed balancer such as Dengie Alfa-A or Hi-Fi Balancer. Hi-Fi ORIGINAL is made from alfalfa which is high temperature dried - locking in the natural goodness - and then blended with quality soft straw to provide a high fibre ration. Alfalfa is an excellent natural source of antioxidants. Hi-Fi Original ican also be used as a partial hay replacer. 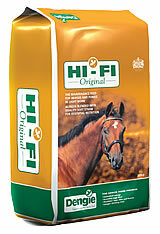 Hi-Fi ORIGINAL can also be fed as a partial hay replacer. The average section of hay weighs around 2kgs which can be replaced with 2kgs of Hi-Fi Original. As Hi-Fi Original is a short 'chop' it takes as long to eat as the equivalent weight of hay or haylage and so helps to keep horses occupied and satisfied. Unlike hay and haylage which can vary in nutritional content from batch to batch, Hi-Fi Original provides consistent nutrition. Alfa-A Lite can be fed as the sole energy source alongside a broad-spectrum vitamin and mineral supplement, such as one of the Dengie Natural Vitality Vits & Mins supplements or a feed balancer such as Dengie Alfa-A or Hi-Fi Balancer. The alfalfa in Alfa-A Lite is dried at a very high temperature which helps to reduce mould. Efficient extraction processes ensure Alfa-A Lite has a low dust content making it ideal for promoting good respiratory health. B vitamins have a wide range of functions within the horse's digestive system including energy metabolism and growth and development. Healthy Hooves was the first chopped fibre feed on the market with a full range of all these important nutrients. Low sugar and starch - research has shown that horses and ponies predisposed to laminitis are at greater risk if fed cereals. Healthy Hooves is free from whole cereal grains. Highly palatable - Healthy Hooves contains added garlic for great palatability and pellets for added interest. Healthy Hooves is designed to be fed as the sole bucket feed alongside your horse’s normal hay/haylage ration. It is important that it is fed at the recommended quantities in order to provide the levels of nutrients your horse or pony requires; feeding less may affect condition and performance. If using less than recommended quantities, a broad spectrum vitamin and mineral supplement should be used alongside. 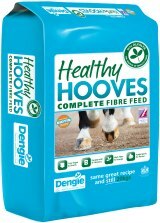 Healthy Hooves is intended for horses and ponies at rest or in light work if fed as the sole bucket feed. For horses and ponies in moderate to hard work or requiring weight gain, Dengie Alfa-Beet can be fed alongside Healthy Hooves and is also approved by the Laminitis Trust. Feed 500g of Healthy Hooves per 100kg of your horse's bodyweight. Fibre weighs very little compared to mixes or cubes. It is important to weigh your scoop to ensure that you are feeding the correct amount. A large Stubbs scoop holds approxiamtely 600grams. Made from 100% alfalfa which is cut at its most nutritious stage of growth and high temperature dried, Alfalfa Pellets are a quick, convenient way of feeding alfalfa. 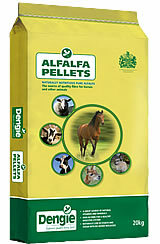 Alfalfa pellets are a natural highly nutritious feed in a pelleted form. They supply 'slow releasing' energy in the form of highly digestible fibre, and provide good quality protein as well as a host of natural vitamins and minerals. 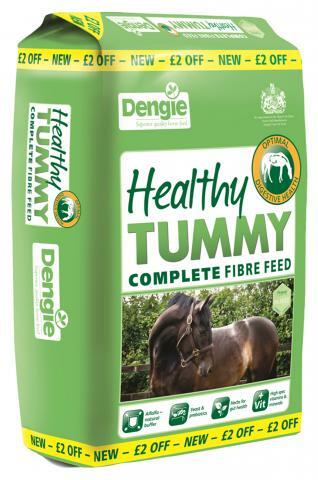 Equestrian & Farm feeds hold the full range of Dengie products. Should we not have what you require on site, we will order it in for you. Dengie Alfa-Beet is a low sugar conditioning feed for horses and ponies. 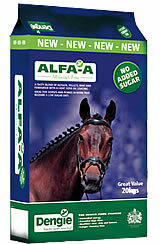 A blend of alfalfa and sugar beet, Alfa-Beet is ideal for extra condition or energy for work, for fizzy horses and ponies as well as older horses who are having difficulties chewing. The combination of alfalfa and unmolassed sugar beet pulp provides 'slow releasing' energy in the form of highly digestible fibre. Alfa-Beet is therefore ideal for weight gain without over-exuberance. Alfalfa is naturally low in sugar (water soluble carbohydrates) and Alfa-Beet contains only a quarter of the water-soluble carbohydrates found in conventional molassed sugar beet. 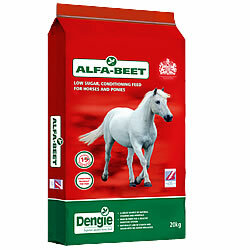 Fed with Dengie Hi-Fi Lite, Alfa-Beet is ideal for those horses and ponies, which require a lower sugar diet. Alfa-Beet is a suitable feed for the healthy maintenance of horses and ponies prone to laminitis and is approved by the Laminitis Trust. Short Soak Time - Hot Soak in 15 mins! One large Stubbs scoop of soaked Alfa-Beet holds 0.5kg of dry matter if soaked at a 3 parts water to 1 par Alfa-Beet ratio.